ALLEN – (27-3) Tarleton State was ushered to an early exit from the Lone Star Conference tournament, falling to (23-7) Texas A&M – Commerce in a nail bitter, 53-51. A Mo Lee three for the win at the buzzer hit the front iron in Friday night’s semi-final round at the Allen Convention Center. Tarleton State entered the game as the No. 1 seed in the tournament and the region, and the loss snapped a 14-game win streak. 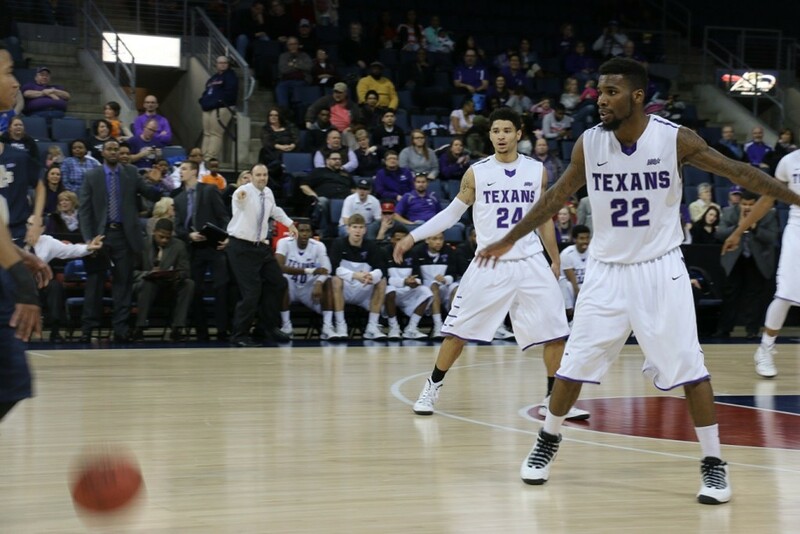 Tarleton State is now 9-2 in Allen and before the loss had won 7 straight dating back to 2013. The Texans won the two previous meetings against the Lions this season, including a 68-48 shellacking last Sunday at Wisdom Gym. 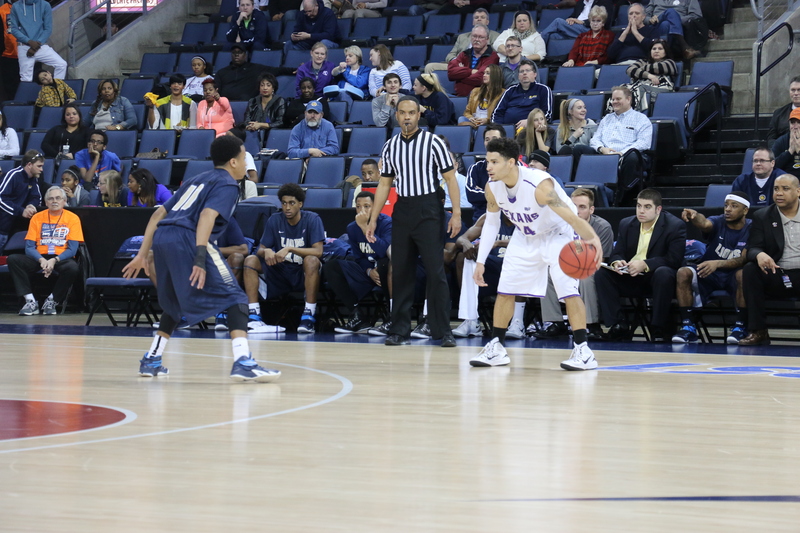 TSU trailed by as many as 12 points and never led by more than four on Friday in Allen. Tarleton State Head Coach Lonn Reisman acknowledged the timing disruption by the Lions after the game. After the Lions shot 54.5-percent from the field in the first half, the Texan defense held them to 4-21 (19.0%) from the floor in the second, and 0-6 from behind the arc. A LaDon Carnegie lay-up with 7:20 left to play in the game was the last field goal made by the Lions, as their last eight points came at the charity stripe. The 10-point halftime deficit was the largest of the season for the Texans and the 51 points were the lowest they have scored all season. This is Commerce’s first time in the LSC championship game since 2008. EJ Reed led the Texans in scoring with 15 points. Malcolm Hamilton had nine, Michael Hardge had eight and Lee fought for all seven of his. Davene Carter (4), Deshawn Riddick (3), Nosa Ebomwonyi (3) and Damion Clemons (2) rounded out the scoring. The NCAA selection committee will determine the fate of the Texans season. The Texans have been ranked No. 1 in the region since the polls came out three weeks ago, and if they retain that ranking, they will host the regional rounds of the NCAA tournament at Wisdom Gym. The Lions won the opening tip and got the first three points on the board. After being held scoreless on Sunday, Carnegie split a pair of free throws to get in stat column. Reed’s free throw got the Texans on the board and a Hamilton triple from the top of the key knotted the game at four. Neither team opened well on the offensive end, as the two were a combined 3-12 from the floor through five minutes of play. The shooting woes for both teams continued for the next five minutes, and Commerce took a 12-8 lead after an Anthony Adams three. Hardge answered right back on the ensuing Texan possession with a triple of his own at the nine-minute mark of the opening half. Reed scored five straight points to give the Texans their first lead of the game, 16-14 with 7:30 left before the break. Another quick five Tarleton State points, were followed by sixteen straight Commerce points, and TAMUC built its largest lead of the half. The Lions led 33-21 with two minutes and change to play. Another Reed triple stopped the Lion scoring run, and closed the gap to nine points. A Williams’ bucket from the elbow in the closing seconds gave the Lions a 35-25 lead going into the locker room. Reed led all scorers with 12 points, but the rest of the Texans struggled on the offensive end. Everyone not named Reed was a combined 4-13 (30.7%) from the floor. 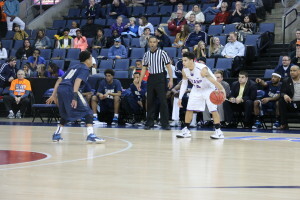 Williams led the Lions in scoring with 11, and Carnegie chipped in eight. 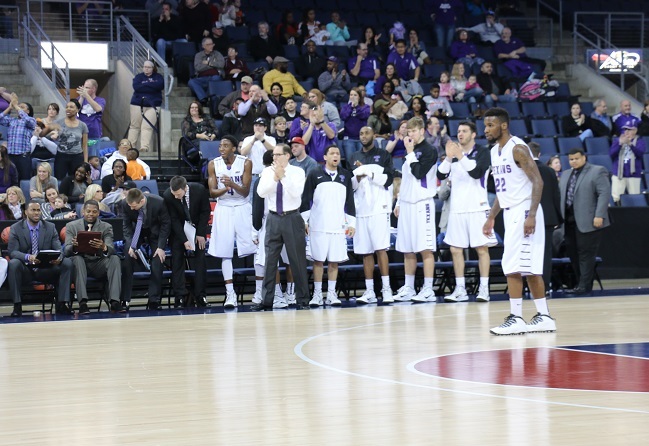 The 10-point deficit was Tarleton State’s largest of the season. Reed continued to find ways to score in the second half and got the Texans on the board first with a pair of free throws. The Lions recovered and built an eleven-point lead with fifteen minutes to play. 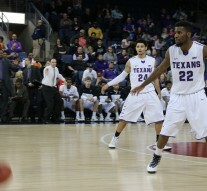 Three pointers by Hardge and Riddick ignited the Tarleton faithful and pulled the Texans back to within five, 41-36. A beautiful no-look feed from Lee to Carter led to an easy two points, and Ebomwonyi’s trey on the next possession pulled the Texans to within two with a little more than eight minutes to play. Lee was fouled hard on a three-point attempt and knocked down all three freebies to give the Texans the lead, 44-43. Commerce responded with a bucket to retake a one-point lead. A put-back slam by Carter to tie the game, was followed by a pair of Carnegie free throws. Hamilton made a strong drive and threw down a monster right-hand jam to tie the game for the sixth time. Hamilton responded to three-straight Commerce free throws with another drive for an easy two. Williams scored his nineteenth and twentieth points of the game to put the Texans down by three with under a minute to play. Lee made one of two from the stripe to pull within two. Hardge’s block of Adams gave the Texans a chance, trailing 53-51 with under twenty seconds to play. Lee’s three point shot hit the front rim, and the Texans were bounced from the LSC tournament after falling short, 53-51.